Just behind the limestone bluffs that overlook the Mississippi River grow acres and acres of oaks, hickories, maples, and walnuts. Principia's forest allows students to take a few steps away from the traditional classroom and enter a living laboratory where they can examine the ecology of a forest. Recently, students have studied the carbon storage capacity of the forest, deer predation of acorns and hickory nuts, bird nest location preferences, oak and hickory regeneration limitations, and sustainable timber harvest plans. Our comprehensive forest management plan ensures that a healthy forest will endure for future generations. The plan begins with a thorough inventory, which helps us identify the quantity and quality of trees as well as areas with important conservation characteristics. For example, data from the inventory suggests that the forest contains far more black oaks, red oaks, and maples than it did 200 years ago. Also, a decline in white oaks was observed. Furthermore, young oaks and hickories are largely absent. Several invasive species, such as bush honeysuckle and garlic mustard, have been multiplying in the understory of the forest. While frequent surface fires had a historically important role in shaping the forest, significant challenges hinder us from implementing fire on a larger scale; instead, only small areas can be burned occasionally. All these observations about our forest directly inform our plans. The forest management plan includes provisions for identifying and protecting ecosystem services; rare, threatened, and endangered species; economic and social impacts; and environmental impacts. 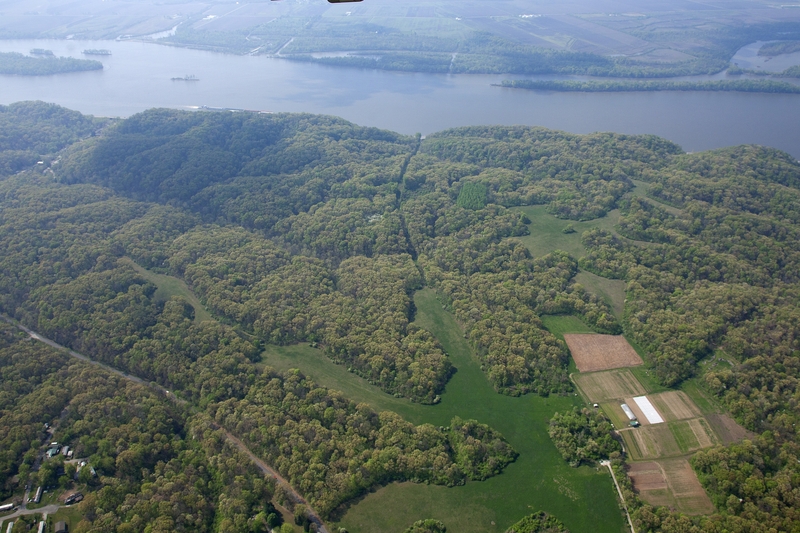 Under Principia's stewardship, forested land has increased by 425 acres and is expected to increase another 50 acres in the next 10 years. Principia has earned Forest Stewardship Council™ (FSC) Forest Management certification from Scientific Certification Systems (SCS), one of the world’s leading FSC certifiers and one of FSC’s founding members. FSC provides third-party certification confirming that materials sold as FSC certified are harvested from well-managed forest operations. The FSC certified products include logs, firewood, and maple syrup. Scientific Certification Systems is the leader in environmental and sustainability certification. One of the first certification bodies accredited by FSC in 1996, SCS has since certified more than 30 million acres of well-managed forests and 3,000 companies in the FSC supply chain worldwide. Principia's trademark license code is FSC-C109754. For more information on how to find certified products or to request a summary of the forest management plan, please email Land Stewardship. The iconic tallgrass prairie of the Midwest is a unique and beautiful ecosystem. However, where these prairies were once expansive, now only a few remnants remain. In Illinois, less than 0.01 percent of historic prairies remain intact today. This is mainly due to the fact that prairies generally occur on rich soil in level areas—ideal locations for farming. However, in a few areas, such as steep, south facing bluffs, grasses still grow as the land is too steep to farm and too hot and dry for trees to grow. Principia’s four miles of bluff-front property are home to many of these bluff prairies. Due to a variety of changing conditions, restoring and preserving these remnants has become a high priority. The grass communities of these prairies were historically maintained by fire, but today fires are less frequent, and trees and bushes slowly edge out the grasses. Principia works to maintain these unique areas by removing the trees and bushes, and executing prescribed burns. Principia has worked on other prairie restoration projects as well. A farm field near the Gate House was converted to a native tallgrass prairie nearly two decades ago. Today it is an easily accessible outdoor classroom, where students learn to identify prairie plants, study small mammal populations, and gain firsthand knowledge about executing prescribed burns. Another prairie restoration is in the works for the farm field across from the Gate House. When complete, the restoration will cover 40 acres of land, providing an expansive area for studying plants, wildlife, and soil. Our prairies are one of the things that make Principia so unique, and we are always looking for new ways to protect and enhance these rare biological treasures. Led by the Biology and Natural Resources Operations Manager, the Land Stewardship Work Crew is a group of student workers who assist in managing Principia’s natural areas. The group performs a range of tasks that are essential in caring for our native ecosystems. Much of Stew Crew’s work centers around maintaining a healthy forest. They conduct inventories of the forest, which give us accurate and up-to-date information about the trees. This in turn influences management decisions related to timber harvest, etc. Stew Crew also works to combat the spread of honeysuckle in Principia’s forests. An invasive shrub, honeysuckle has become prevalent in much of the Midwest. Its dense foliage shades the forest floor and prevents tree seedlings from growing, thus changing the composition of the forest. We are working to reverse the spread of honeysuckle by cutting down plants directly and through the use of herbicides. Stew Crew also offers students the opportunity to participate in a chainsaw certification class, where they learn how to maintain and safely operate a chainsaw and learn the basics of felling a tree. Students are then able to assist in forest management projects such as thinning the tulip poplar plantation. Stew Crew also works to preserve our prairies. 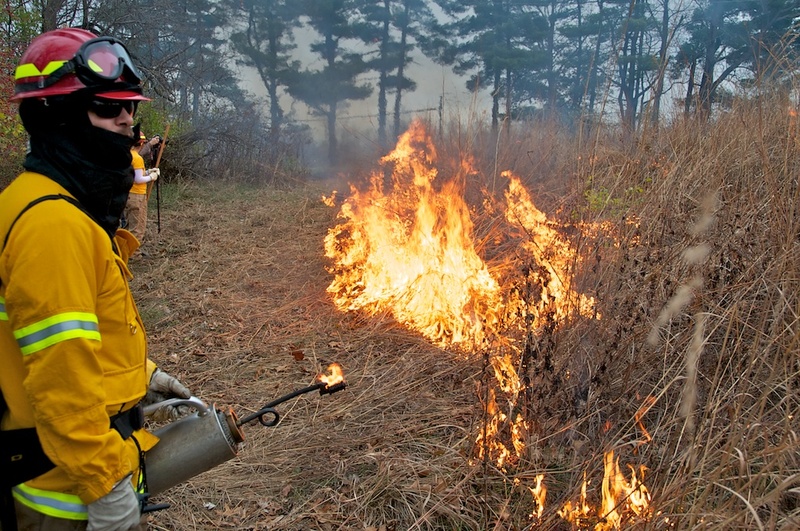 They remove woody vegetation from the bluff prairies that can edge out the grasses and help maintain the Gate House prairies by assisting in prescribed burns. Fire is a natural part of a prairie ecosystem and is essential to its health. Members of the Land Stewardship Work Crew gain valuable knowledge of fire as a management tool while contributing to the prairie ecosystem. Just behind Elsah lies Three Rivers Community Farm, a 12-acre, chemical-free farm. The farm produces an array of delicious fruits and vegetables, all free of herbicides, pesticides, and chemical fertilizers. Their goal is to produce delicious, local food that is grown in harmony with the environment. Three Rivers Community Farm runs a Community Supported Agriculture (CSA) program, where local Illinois and St. Louis residents can buy a share of the season’s harvest. Shareholders pay a fee, which helps support farm operations, and in return, they receive produce from the farm. Every week, shareholders can pick up their goodies, which may include broccoli, tomatoes, watermelon, sweet potatoes, and much more! Since the farm’s beginning in 2007, the CSA has grown from 150 to 250 members. Fruits and vegetables from the farm are also sold at local farmers’ markets. Three Rivers Community Farm is open for visits and also hires interns and apprentices from the local community. For more information about Three Rivers Community Farm, visit their website: www.threeriverscommunityfarm.com. Principia’s community garden is located in the heart of the College campus. Garden plots are available to community members who may not have yard space for a garden. Tomatoes, peppers, and artichokes all grow there! The garden staff also reaches out to Principians by providing fresh greens and vegetables to Dining Services. Community garden workers are always looking for new ways to operate sustainably and hope you'll join them in discovering the fun of growing your own food! Principia’s greenhouse is an excellent resource for any plant lover in the community. The greenhouse is home to a variety of plants, from native prairie grasses to bromeliads to cacti! But this space isn’t only for show—it houses plants used for student and faculty research. Seedlings for the community garden are also started here. Maintained by students, the greenhouse is a great place to learn about caring for a wide range of plants. Mapping the world around us is an extremely useful tool for making land management decisions. At Principia, both students and faculty have undertaken GIS projects that provide valuable information about Principia’s property. One recent project compared the current forest cover on Principia property to the forest cover in 1950, revealing that Principia’s management has resulted in an increase in forested land. GIS has also been used to map the productivity of the sugarbush and identify characteristics of the most successful areas. Future Sugarbush Management classes are sure to benefit from this data. The drainage system on campus was also mapped recently, providing a much-needed update to facilities information and shedding light on erosion patterns near the developed areas of campus. The applications of GIS are endless—it can be used to gain data on everything from soil characteristics to wildlife to human resource use. Enroll in Environmental Mapping to learn how to use GIS to answer important questions about our surroundings and create focused solutions to land-management problems.